“Old soldiers,” General MacArthur famously said, “never die, they just fade away.” And the wars they fought fade from memory too. So what can you say about a war that ended 30 years ago and yet still is in the public’s mind? Perhaps that it never really ended? 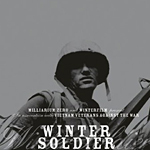 Winter Soldier is a window looking back in time to the U.S. war in Vietnam. And in some ways the intervening years and current events have now made it into two films. It is both a valuable historical artifact and a fresh warning that is as important today as it was when it was released in 1972. The film itself is simply a testimonial record of atrocities committed against Vietnamese civilians by US soldiers (and most importantly) with the knowledge and sometimes encouragement of their officers. The men giving this testimony were all veterans of that war, recently returned to “the world.” They were rightly outraged at the U.S. public’s ignorance of what was going on in Vietnam and were desperate to tell their stories. Having no recourse through the military or mainstream press, 125 of them (including a young John Kerry ) met in 1971 at a Detroit Howard Johnson’s to testify on their own. The purpose of Winter Soldier was to set down for the record the things they had seen and done. For some, the resurgence of this film is opening an old wound. For others, the wound won’t be healed until it’s attended to. Should you doubt that Winter Soldier is relevant today, consider the following thoughts on past wars and how they are remembered. If at any time in the last 25 years you had asked the average American visitor to Washington D.C. if they had gone to “the war memorial,” chances are good they would have thought you meant the Vietnam Veterans Memorial, the popular site consisting of Maya Ying Lin’s Memorial Wall, Frederick Hart’s Three Servicemen Statue and Glenna Goodacre’s Vietnam’s Women’s Memorial. That would be “the war memorial,” even though the city is filled with monuments and memorials from many past wars. 1. The Vietnam Veteran’s Memorial Wall, 2. Korean War Veterans Memorial, 3. Vietnam Veterans Memorial, 4. African American Civil War Memorial 5. The National World War II Memorial. This is reasonable in that, with the exception of the African American Civil War Memorial, the most recent war garners the most attention. In fact the Vietnam War gets two separate citations. However if you were to rank any past conflict by the sheer number of monuments in Washington D.C., the American Civil War would win hands down. In its day, the Civil War loomed larger than anything else in the public’s mind. Today most visitors to Washington D.C. walk past the Civil War statuary unaware that it is even there. The memory of old wars, like old soldiers, does fade with time. 1. Vietnam Memorial Wall was dedicated in 1982, 2. the Korean War Veterans Memorial in 1995, 3. The African American Civil War Memorial in 1998, 4. the National World War II Memorial in 2004. The U.S. involvement in Vietnam ended in 1974 which means that the Vietnam Memorial was created first and relatively soon after the conflict ended. By this gauge, there should be a Gulf War I monument in place by now. The other wars were memorialized many years after the fact (The African American Civil War Memorial remains an anomaly and I’ll get back to that in a moment). What is it about Vietnam that still raises the passions of the American public like it does? Why did it need to be memorialized so quickly? I think it was the same thing (though on a smaller scale) that put all that Civil War statuary in place. Both were centered around internecine arguments that almost destroyed the country. If you have never heard of the Winter Soldier hearings, join the crowd. What the soldiers testified to remains to this day uncomfortable, partisan, and to many, heretical and blasphemously unpatriotic. That’s not to question the veracity of Winter Soldier. What the vets testified to was true then, and it’s true now. The resistance to, and defacto public repression of, Winter Soldier has to do with its politics, denial, and a national selective memory. At the time the film was made, the Vietnam Veterans Against the War were running afoul of the Nixon Administration’s public prosecution of the war. Today Winter Soldier deflates several notions central to the Neoconservative mythos. There is a modern conservative stereotype of many Vietnam vets as victim of Leftist antiwar abuse (namely, that vets were spat upon by anti-war activists). There’s also the notion that vets who spoke out against the war were neurotic and unpatriotic losers, apt to go insane at any moment. But the veterans in Winter Soldier are not castigated as baby killers or mocked as disgruntled Rambos. They are shown to be sincere young men scarred by their experience and angry at the ambivalence they have met at home. One vet relates how he had been speaking at a college and was accused of being a murderer. His confusion and hurt is apparent and I’m sure that the scene was included as a warning to anti-war activists not to confuse the messenger with the message. This is a difficult film to watch. One is appalled at the magnitude of the events described, and how easily and completely they have gone unreported. Vietnam was not the first time in military history that Americans have committed atrocities. Sand Creek, Wounded Knee and the Philippine Insurrection come to mind. If you are not familiar with them, it’s because there was no Winter Soldier to tell their story, or if there was, it was successfully suppressed. Thirty years later, the whole picture of what the Vietnam veterans experienced is still not generally known. And what is known is often distorted or simply not true. If there was one thing that has been suppressed it was the nature of the top-down chain of command that allowed and encouraged the soldiers to go out of bounds. A soldier is trained to be a killer; who he kills is the responsibility of his officers. But what are those officers to do when they are ordered to meet impossible goals by their superiors? And so it goes, up the ladder. When the finger of blame gets pointed in that direction, there is a flurry of activity to change the subject, build a memorial, find a scapegoat. The generals running the war in Iraq today were young soldiers in Vietnam in 1971 and it is an axiom that generals prepare to fight the previous war. Some of the lessons of Vietnam are being put to use in Baghdad in that the U.S. military is behaving better in Iraq. Sadly another lesson learned was to mistrust the press and to keep it at a distance. But as was learned at Abu Ghraib, coverups don’t work and in a strange way Vietnam still haunts us. The reporter credited with breaking the My Lai story was Seymour Hersh, the same man who reported on Abu Ghraib. Both of those stories started with letters home by soldiers who knew what they had seen was wrong. Maybe the biggest lesson from Winter Soldier and the Iraqi prisons is that there were good people in the Army then, there are good people in the Army now, and when they are allowed to tell their fellow citizens that a wrong has happened, it still matters. Winter Soldier is very much a film of its own time. Something that might be missed by modern audiences is the significance of the vets’ longhaired appearance, which marked them as being firmly on one side of the political divide as surely as if they had changed a blue uniform for gray. At one point in the film, a “straight” interviewer asks one of the vets if he was aware that he might be taken more seriously if he got a haircut and a shave. Things like that are not included by accident and that comment echoed the 1968 Eugene McGovern campaign when his young volunteers would be trimmed and shaved, declaring themselves to be “clean for Gene.” The vet answers that he “likes the way it feels” an answer that resonated then but falls flat today. One wonders whether if the vets had all snapped to uniformed attention, as Ollie North did 10 years later during the Iran-Contra hearings, their postwar history would have been different. But at the time, that kind of behavior would have been just too bizarre to imagine. If war atrocities and opposition to the war in Vietnam are the main themes in Winter Soldier, then racism is its subtext. The antiwar movement in the U.S. grew out of the Civil Rights Movement of the 1960s. But in 1972 the word “racism” was still fairly new to most of the public. The vets in Winter Soldier comment on how the Vietnamese were seen as less than human, a mindset that led directly to many of the abuses. The race theme may also explain a scene where a black man castigates a white vet for glossing over the inherent racism in the war, the VVAW meeting and U.S. culture in general. Perhaps the black man saw that the vets who testified were disproportionally white compared to the number of black soldiers who saw combat. It may be that the filmmakers, having been on the receiving end of that lecture, were careful to include the black man’s diatribe in the final cut. Curiously, Vietnam did more to mainstream blacks into the military than anything else since Reconstruction. The officer who investigated the early reports of the My Lai Massacre was the young Maj. Colin Powell. And that brings me back to the African American Civil War Memorial. Why would there be so much Internet interest in it? Perhaps it combines all the elements of denial, selective memory and political impropriety seen in Winter Soldier but played out over a hundred years of history. In the hundred years after the Civil War, there was a myth built up of who we are and what the United States stands for. But behind that myth was a reality that could not be papered over. And if you don’t think righting that wrong hasn’t caused a stir among those that subscribed to the myth, consider the popularity today of the Civil War reenactors and especially the Confederate ones. Winter Soldier is like a cold Civil War cannon on the Court House lawn, but with its connection to the politics of today, it’s as hot as when it was fired in anger. The New Yorker DVD of Winter Soldier has excellent extra features. This is what DVD bonus features are all about, and what can make the DVD better than the film. The Short Conversation with the Filmmakers is particularly good. This is a round table discussion done 30 years later. The Filmmakers look back (with pride) to when they made WS and remember the troubles and rewards of making the documentary. Sadly, the vets themselves are absent at the discussion. That is more than made up for with the extra 40-minute film Seasoned Veteran: The Journey of a Winter Soldier. 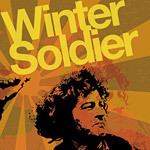 This amazing film tells what happened to Scot Camil (a vet featured in Winter Soldier) after 1971 and is more than a bonus feature. This documentary alone proves to be worth the price of of the DVD. But wait, there’s more! At the time, three short films were made from the footage for the participating VVAW groups, and these are also included as extras. Also on tap are the Graham Nash song “Oh! Camil”, a stills gallery of VVAW images and over 1,000 PDF pages of documentation. Picture quality is as good as can be expected, given that the original film stock was out-of-date black-and-white donated to the cause. So a lot of the footage is grainy and some is even a little fogged. There is an amusing story in the Short Conversation piece about where some of the film stock came from. Sound quality is about the same as the picture quality. Considering that they were working with whatever they could get, the sound is good enough.